Dental implants are designed to provide a foundation for replacement teeth that look, feel and function like natural teeth. The person who has lost teeth regains the ability to eat virtually anything and can smile with confidence, knowing that teeth appear natural and that facial contours will be preserved. The implants are tiny titanium posts, which are placed into the jawbone where teeth are missing. The bone bonds with the titanium, creating a strong foundation for artificial teeth. In addition, implants can help preserve facial structure, preventing the bone deterioration that occurs when teeth are missing. Dental implants are changing the way people live! With them, people are rediscovering the comfort and confidence to eat, speak, laugh and enjoy life. For more information about dental implants or to schedule a consultation appointment in our Port Elizabeth office, please call +27 (0)41 365 6735. If, like many others, you feel implant dentistry is the choice for you, we ask that you undergo a dental/radiographic examination and health history. During these consultation visits, your specific needs and considerations will be addressed by either our doctors or by an Oral and Maxillofacial Surgeon referred by our practice. Your questions and concerns are important to us and our team will work with you very closely to help make your procedure a success. Dental implants are metal anchors, which act as tooth root substitutes. They are surgically placed into the jawbone. Small posts are then attached to the implant, which protrudes through the gums. These posts provide stable anchors for artificial replacement teeth. After the implant has bonded to the jawbone, the second phase begins. The surgeon will uncover the implants and attach a small healing collar. Our doctors can then start making your new teeth. An impression must be taken. 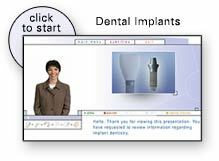 Then posts or attachments can be connected to the implants. The replacement teeth are then made over the posts or attachments. The entire procedure usually takes six to eight months. Most patients do not experience any disruption in their daily life. Where damage to a person's teeth is extreme, and apparently beyond repair, we can use porcelain or porcelain metal crowns to make the smile appear "as new". This is an extremely reliable technique for repairing the most severe of dental problems, even permanently replacing missing teeth to offer a complete smile and a functional bite. For more information on dental crowns in Port Elizabeth call +27 (0)41 365 6735. Many people have unexplained pain from filled back teeth, which is usually due to hairline cracks in the chewing part of the tooth. Placing crowns on these teeth relieves the pain and allows a return of full dental function for these teeth. In front teeth, older fillings can both weaken the teeth and cause "appearance" problems due to staining or chipping. Porcelain crowns are suitable in cases where porcelain veneers are not. In teeth with root canal fillings, crowns can prevent breakage. Bridges are seldom used today as dental implants almost completely replaced bridges. Having a beautiful smile may be even easier than you think. Many people achieve the look they've been dreaming of with our simple "bleaching" procedure. It's safe, quick, and inexpensive. Just let us know at any appointment if you would like to begin bleaching. You can lighten only your upper teeth or both the upper and lower, depending on how much you show when you talk and smile. In only a day or two your custom bleach splints will be ready for you to pick up. We provide you with a special bleaching agent that you put into the clear splints. With only a few hours of wear per day, our special bleaching agent bubbles stains right out of your enamel in a very short time without altering tooth structure or existing dental work in any way. When your teeth reach the desired brightness, only occasional treatment is needed to maintain your new smile. We'll want to take "after" photos at your next appointment. Dental bleaching can be used to correct tooth discoloration. Discolorations can be caused by staining, aging, or chemical damage to teeth. Using the latest in bleaching technology, we can offer a safe method for creating a beautiful "brilliant" smile. In cases of extreme tooth discoloration, crowns or veneers may be the only choice, but because of the low cost of bleaching treatments, bleaching is nearly always worth a solid try. Is a near permanent solution for a "dull" smile, restoring brightness and brings a smile alive. An impression is taken to make a specialized "mouthguard" or "stent" to hold the bleach against the teeth. The material is used each night for about 3-4 hours for a week or two, and at the end of this time, significant whitening will occur. In some cases, the change is nothing short of brilliant. For confidence in appearance, bleaching technology allows us to promise improvements in yellowing, aging or stained teeth. For very severely stained teeth, crowns or veneers may be more appropriate. Sensitivity to hot and cold and keep you awake at night. Severe toothache pain and has to take painkillers. A root canal procedure requires one or more appointments and can be performed by a Dentist or an Endodontist (a root canal specialist) or a Prosthodontist(South Africa). In South Africa endodontics is part of the Prosthodontic post graduate ciriculum therefore a Prosthodontist in South Africa is also called an Endodontist. While the tooth is numb an access opening is made on top of the tooth and a series of root canal files are placed into the opening, one at a time, removing the pulp, nerve tissue, and bacteria. If tooth decay is present, it will also be removed with special dental instruments. Once the tooth is thoroughly cleaned, it will be sealed with either a permanent filling,or, if additional appointments are needed, a temporary filling will be placed. At the second appointment, the temporary sealant is removed. Our doctorswill then make sure that the inlay or onlay fits correctly. If the fit is satisfactory, the inlay or onlay will be bonded to the tooth with a strong resin and polished to a smooth finish. A denture or a complete denture as it is often called, is an appliance that is inserted in the mouth, replaces natural teeth and provides support for the cheeks and lips. For more information on dentures or to schedule a consultation appointment, call our Port Elizabeth office +27 (0)41 365 6735.